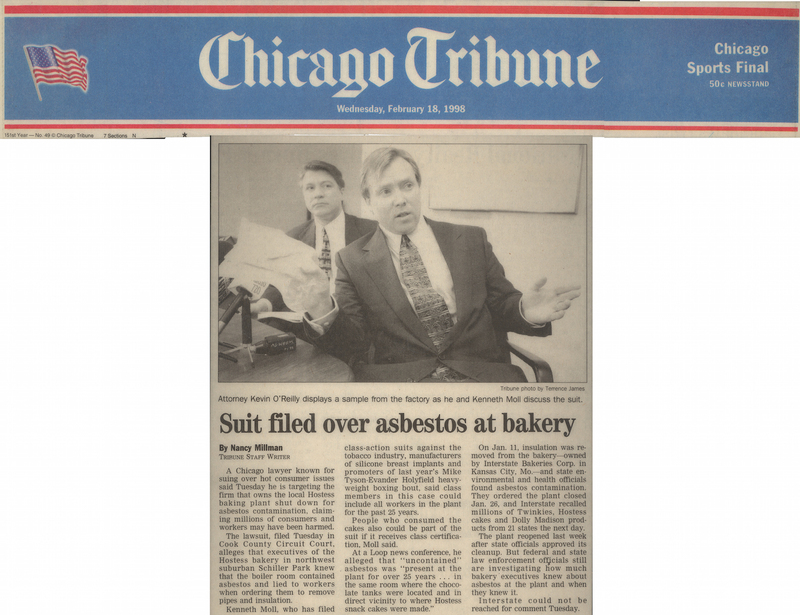 A Chicago lawyer known for suing over hot consumer issues said Tuesday he is targeting the firm that owns the local Hostess baking plant shut down for asbestos contamination, claiming millions of consumers and workers may have been harmed. The lawsuit, filed Tuesday in Cook County Circuit Court, alleges that executives of the Hostess bakery in northwest suburban Schiller Park knew that the boiler room contained asbestos and lied to workers when ordering them to remove pipes and insulation. Kenneth Moll, who has filed class-action suits against the tobacco industry, manufacturers of silicone breast implants and promoters of last year's Mike Tyson-Evander Holyfield heavy-weight boxing bout, said class members in this case could include all workers in the plant for the past 25 years. People who consumed the cakes also could be part of the suit if it receives class certification, Moll said. At a Loop news conference, he alleged that "uncontained" asbestos was "present at the plant for over 25 years . . . in the same room where the chocolate tanks were located and in direct vicinity to where Hostess snack cakes were made." On Jan. 11, insulation was removed from the bakery - owned by Interstate Bakeries Corp. in Kansas City, Mo. - and state environmental and health officials found asbestos contamination. They ordered the plant closed Jan. 26, and Interstate recalled millions of Twinkies, Hostess cakes and Dolly Madison products from 21 states the next day. The plant reopened last week after state officials approved its cleanup. But federal and state law enforcement officials still are investigating how much bakery executives knew about asbestos at the plant and when they knew it. Interstate could not be reached for comment Tuesday.